Founded in 1980, Nourison is the world’s leading and most diversified producer and importer of handmade area rugs. In recent years, the company has also introduced several highly acclaimed powerloom collections, which have set new standards of design innovation for the entire area rug market. Recognized throughout the home fashion community for the quality of its assortments and the its innovative approach to product development, Nourison today supplies more than sixty active collections to fine retailers throughout the world. From classic Tibetan weaves to hand-knotted Chinese carpets, from our patented Nourmak flatweave to luxuriously hand-finished powerloom designs, Nourison rugs represent a truly unique combination of beauty, craftsmanship, and quality. In every price and construction category we offer, the Nourison label is your guarantee of lasting value. 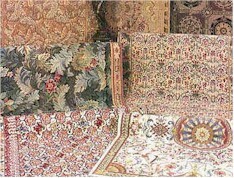 In service as well as selection, Nourison is dedicated to the highest possible standards of customer satisfaction. By maintaining the largest back-up inventories in the area rug industry, we ensure that you, the consumer, can depend upon prompt delivery of the rug you select at your local retailer. In point of fact, we are proud to say that well over 90% of the orders we receive from our dealers are shipped from our facilities within 48 hours. Any purchase you make for your home is an important one. At Nourison, we believe that the rug you select today should give you genuine pleasure and satisfaction for many years to come. We hope that the information that follows on this website will help you find the perfect rug for your home and lifestyle.